One of my absolute favorite hymns! As a child growing up I loved going to the small country churches my East Texas family attended. Summer time was hot and humid so the doors were always left open in hopes of a cool breeze. Handheld paper fans and church bulletins were fluttering across the one room church house offering a bit of relief from the Texas heat. The sun was shining through the hand hewn stained glass windows, creating beautiful colorful patterns on the rough wood floors; which were very distracting for this little girl. I have to say that my favorite country church to attend was at Turkey Creek. My mother's family had lived in this little nowhere-on-a-map community since the 1880's, and some still do, or are very close. This place always felt like home. My Aunt Ruby was not just active in the little church, but she was also a caretaker and often times when I was visiting with her, she would gladly let me help. Something other kids might not have wanted to participate in, but that I loved, was helping her maintain the small cemetery. As we would cut the grass and pull the weeds growing around the markers, she would tell me about each person. It seemed she knew the story of everyone there and how we were related to them. She would tell the stories of the original families who settled the area and about the Indians who called Turkey Creek home long before any of our family. I loved hearing all of these stories, which not only brought the history of this little area of East Texas alive to me, but somehow connected me to the pine trees, red dirt and rolling hills. It was my home. As a girl adopted into a family with whom I shared no physical relation, hearing all of these stories about the generations of "my" family, made me feel connected. I was very proud of the little box on the family tree which held my name. ​Forty years later now, and most of those years without an address in or near Turkey Creek, I still consider it home. I still visit the small country church, although not very often. In fact, the last time I was inside was for my daddy's funeral almost five years ago. He, along with my brother, are now residents of that little cemetery that I used to help my aunt care for. She is there also. Along with most of my mother's family. One day I will reside there as well. 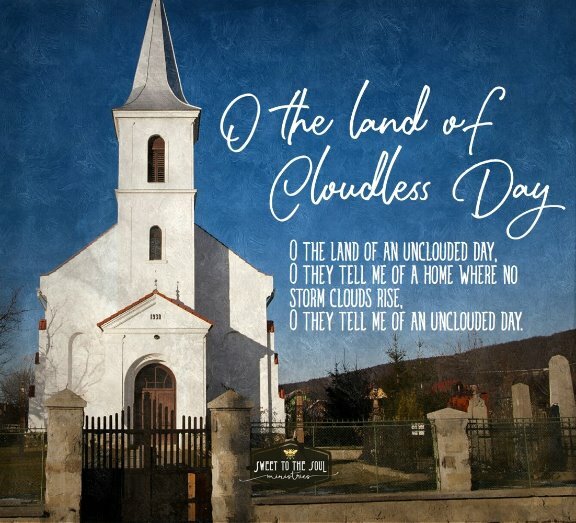 Yes, I know they actually have a different very glorious home, a home where we will all sing these wonderful old hymns together again. A home with unclouded days. Today's blog post is part of our #SundayHymnBook series, where we relive wonderful memories of beautiful old time hymns.